Heroes are often part of a team, part of a system designed to save lives. One person is rarely congratulated for their part in a life-altering situation. Their job is to help, not stand out. Southwest Virginia Community College Associate Professor Bill Akers is one of those unsung heroes. A Virginia State Police Med Flight paramedic, he has worked in EMS for 40 years. He started his long and distinguished career in the field when he was just 15 years old as a member of the Russell County Jr. Rescue Squad. He found real excitement and satisfaction in responding to emergencies and knew he wanted to make it a career. To get to where he wanted to go, he knew he would have to get a combination of the right education and the right skillset. To that end, Akers completed a Bachelor of Science degree in Chemistry from Emory and Henry College in 1983. After graduating, he began work as a science teacher at St. Paul High School in St. Paul, Virginia; teaching during the day and driving to Bristol for Paramedic school at night. He then became a Nationally Registered Paramedic in 1987, the same year he joined the Virginia State Police Med Flight as a paramedic. A few years later, in August of 1991, he changed careers and became a Training Coordinator for the Southwest Virginia EMS Council, Inc. He was in that position until he came to Southwest Virginia Community College, combining his years of experience in EMS and teaching, as the new Paramedic Program Director. He embarked on this venture in January of 2000 and has remained at the helm of the program since then. He earned a Master’s of Science Degree from Virginia Tech in Health Education in May of 2006. One case that stands out to him occurred several years ago. “We had a little six year old girl get run over by a school bus in Baptist Valley. We had just finished a call and were flying out of Buchanan County when we got word of the accident,” said Akers. “We were in the right place at the right time. When we got there, the little girl was dying. We were able to stabilize her and get her quickly to Johnson City Medical Center and the specialists who were waiting on her,” said Akers. Because of the quick care she received, she survived her injuries. 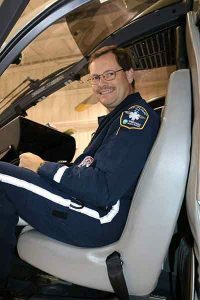 For anyone interested in working with Med Flight, Akers suggests looking into one of three different professional fields, flight paramedic, flight nurse, or pilot. What they do matters to the people on the ground and, it can be dangerous. “There’s a reason we wear fireproof suits and helmets,” said Akers. Bill Akers’ job doesn’t stop when he leaves the college. Like a superhero, when the sun goes down, he saves lives. To find out more about the SWCC Paramedic Programs, call Mr. Akers at 276.964.7729 or visit SWCC’s Program Catalog to learn about these programs.